As a dealership in a competitive market, how do you stand out against the competition? Your Unique Selling Proposition (USP) of course! Simply put, a USP is your chance to grab car shoppers’ attention and explain why your dealership is the only one they should be buying from. It’s your chance to shine and describe what makes you special and, well, unique. More specifically, your USP should clearly lay out what you provide car shoppers that is above-and-beyond what your OEM provides. Let’s face it, if you are a Ford store in the GTA, there are a dozen other business that offer the same product, with the same OEM incentives, at largely the same price. USPs are a collection of unique, tangible and/or quantifiable offers that your dealership provides car shoppers to add value and incentivize them to choose you. If you’re not sure why USPs are so important or need some more ideas on how to create the perfect USP for your dealership, we wrote a blog about it that you can check out here. The best USPs cater to their ideal demographics’ needs. Ask yourself: What is motivating the car shoppers’ buying- what would encourage them to buy from your dealership? A strong USP should highlight a value that will solve a problem for your customers. How can purchasing a vehicle from your dealership help solve a problem that the shopper may have? For example, will you save me time and/or money in the future? Provide additional support or peace of mind when needed? A USP should make a promise that you will deliver on. No, you don’t need to get down on one knee and give a diamond ring to every customer, but do you have an offer that you could make a guarantee on? For example, you could promise that oil changes will be completed in under 30 minutes or they’re free, saving someone time and helping you compete with the Jiffy Lubes of the world. On both your website and advertising, your value proposition should be well-designed to capture attention. Remember, people have short attention spans and often don’t like to read! As with copy on any of your marketing materials, the language should be clear, straightforward and in a way that your specific target demographic would enjoy and understand. Let’s visit the crème de la crème of USPs and learn why they’re in our hall of fame! We love this USP because it has a very simple and clean design with a prominent Call-To-Action (CTA) button, encouraging users to take further action. Other than being easy on the eyes, the USP solves a couple of important problems for potential customers. To increase the convenience of their test drives, they go to the shopper’s location, eliminating the problem of travel if that’s an issue for the buyer (while also saving time). They also solve another problem for customers with busy lives by offering extended service hours. The USP also uses promotions to attract their customers, retain and expand their client base with the referral bonus. Last, but not least, the 30-day money back guarantee for tires promises to customers that their prices are unbeatable. We used this as an example in our last blog about USPs, and now let’s explain why we like it so much. This design for this USP is also highly compelling. The texture of the design breaks the mould of the rest of the hero page and draws the user’s eye to it. The beautiful design highlights the main USP that will attract customers – no hidden/extra fees. This is an awesome aspect to feature because Autotrader reported in this study that satisfaction while test driving was 81%, but after all the paperwork and negotiation it dropped to only 56%. Making the promise that there are no extra fees can prevent surprises in the F&I office that diminish customer satisfaction. Similar to the first example, this USP makes the promise of a 30-day tire price guarantee, so customers can be confident they’re receiving the best deal. Using a ‘guarantee’ makes them feel like they have nothing to lose and everything to gain. Likewise, they cater to their busy bee clients by offering extended service hours. 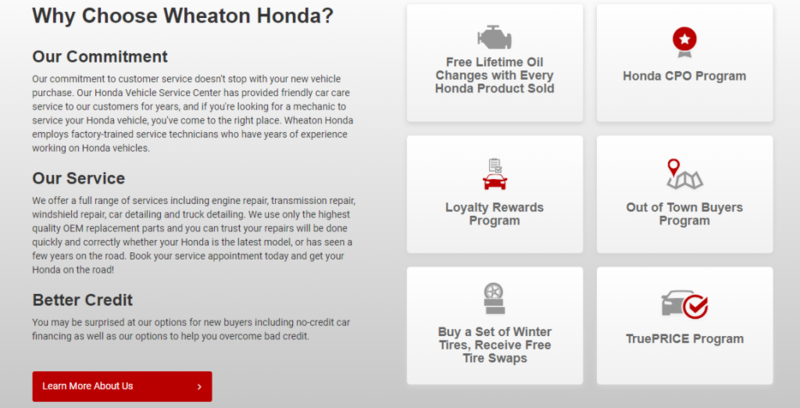 This is valuable not only for the busy car buyers but also for the dealership because this offer also promotes recurring business through their service department. Lastly, the USP is attractive because they have a fantastic offer of free warranty for pre-owned vehicles. Don’t underestimate the word “free” in your copy. There’s nothing like throwing in the word “free” to get customers excited, and this is one they actually can get behind. It will save them a lot of money and potential future headaches while also providing peace-of-mind. There seems to be a trend with these Hall of Fame USPs – a well thought out, simple and uncluttered design. The 30-day exchange policy on pre-owned vehicles appeals to those shoppers worried about potential buyers remorse and encourages them that there’s no risk to buying a car from this dealership. Flexibility is important when making a large purchase, especially when you haven’t bought a product from a store before and the product has been previously owned. It also features an ongoing promotion – free towing and roadside assistance for 3 years. Please note: they used the magic word “free”, and they put the text in bold to draw attention to it. Lifetime Powertrain Coverage. Pretty much anything guaranteed for a lifetime is an attractive offer, especially when all of the components that make up a powertrain are so expensive. Again, a tangible, quantifiable USP that saves car shoppers money and provides peace-of-mind! The reason this USP is a highlight for us is because they commit to exemplary customer service, rather than saving money. They do offer an effective ongoing promotion of free lifetime oil changes but indicated by the design, that’s not this USPs main focus. This commitment illustrates that USPs can be powerful even when they’re not focusing on discounts or savings. It can be an especially effective tactic when you don’t want to compete in a race to the lowest price in the market. Finding something that is special, other than helping customers save money, is just as important and compelling. Like some of the above examples, this USP offers an ‘Out of Town Buyers Program’ that caters to customers that don’t live close by. This would be highly attractive for shoppers needing to save time travelling to the dealership, but also a great strategy to conquest outlying markets. Finally, they highlight that they have no-credit car financing. This, of course, would be enticing for new car buyers and/or buyers with bad credit wanting to purchase a new vehicle, therefore, solving another hurdle for car buyers and ensuring they tap into a significant chunk of the Canadian market. The thing that stands out to us the most with this USP is their beautiful, unique and eye-catching design. Similar to the above examples, it also addresses numerous pain-points for potential customers. They offer lifetime towing, lifetime engine warranties and a ‘7-day exchange purchase protection’, which is an ongoing promotion and commitment that the buyers can exchange a vehicle if the dealership can’t solve a mechanical issue in 7 days. These three offers not only help them save money but also reduce the risk for buyers just knowing that they have the warranties. This USP also has a creative and exclusive offer: Away from Home Accommodation Reimbursement. They promise that if the car breaks down on a road trip, the dealership will cover the accommodation until it’s repaired, potentially saving the customers a lot of money, and therefore, stress. A recurring theme amongst our hall of fame UPSs is ensuring they are presented in a pleasing design and include creative, valuable promotions or guarantees. All of the offers solve a particular problem for potential buyers – whether that’s saving them time, money, buyers remorse or a trip to the dealership. Let’s face it, creating an exclusive USP can be quite a tricky feat, especially when you’re a dealership in a busy marketplace and have many competitors, some with the same programs from your OEM. If you need help creating an interesting and unbeatable USP to integrate into your marketing strategy, we’d love to help. Reach out today! Let’s Create The Perfect USP Together!